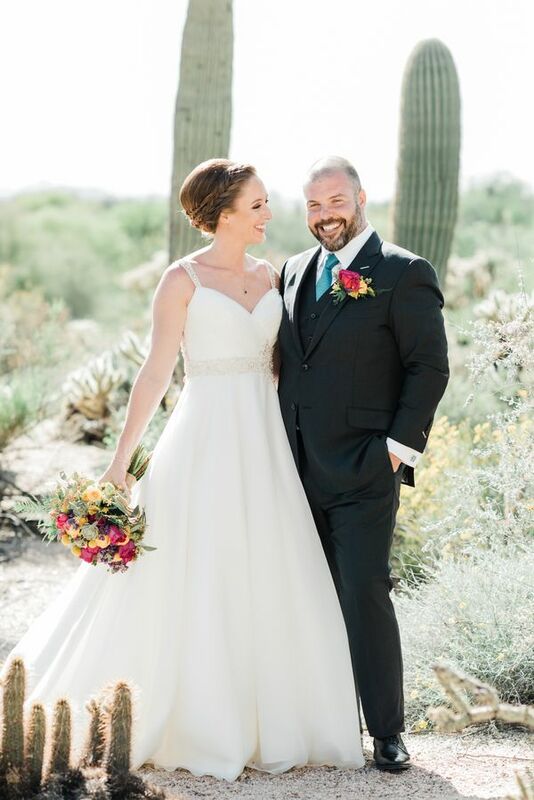 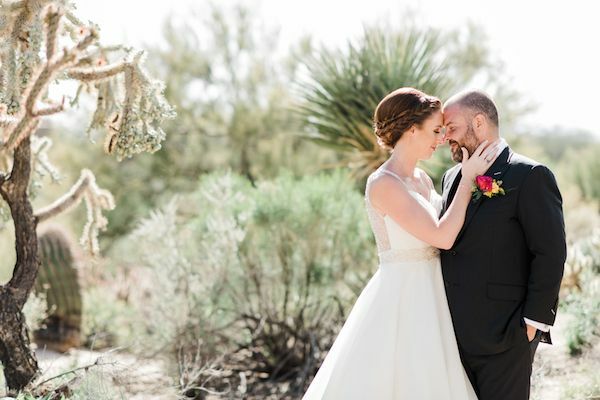 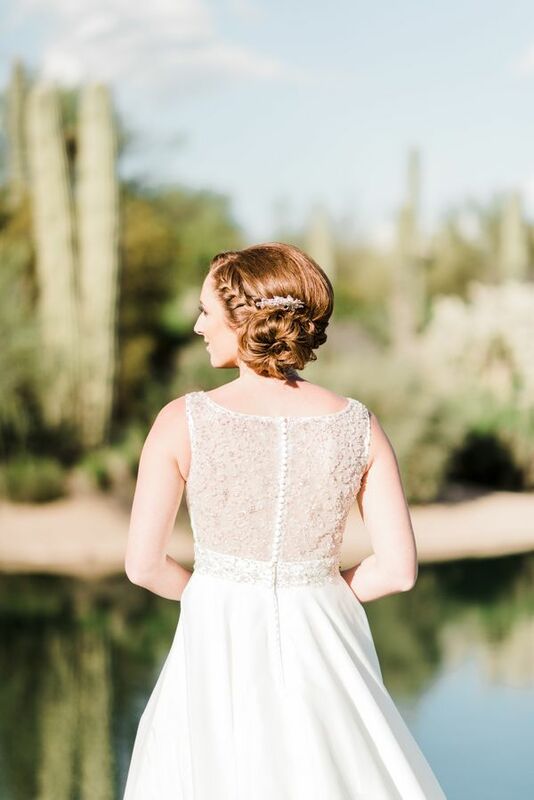 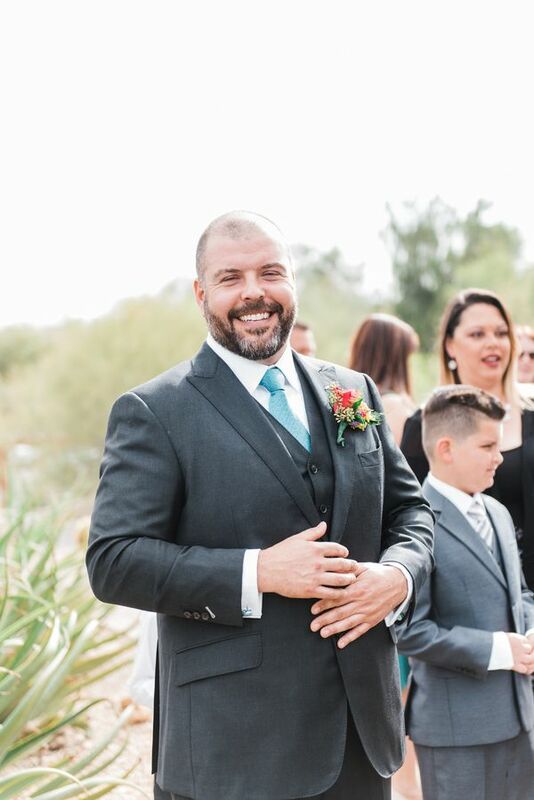 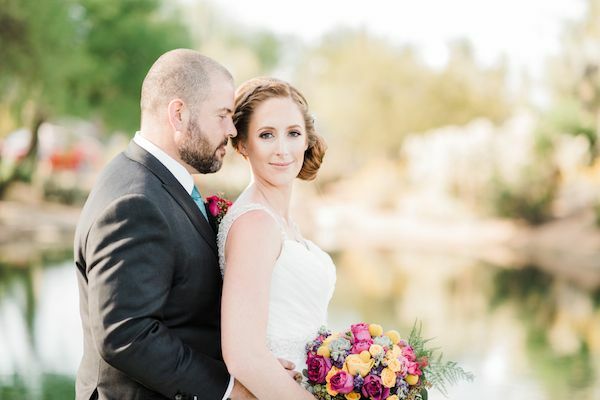 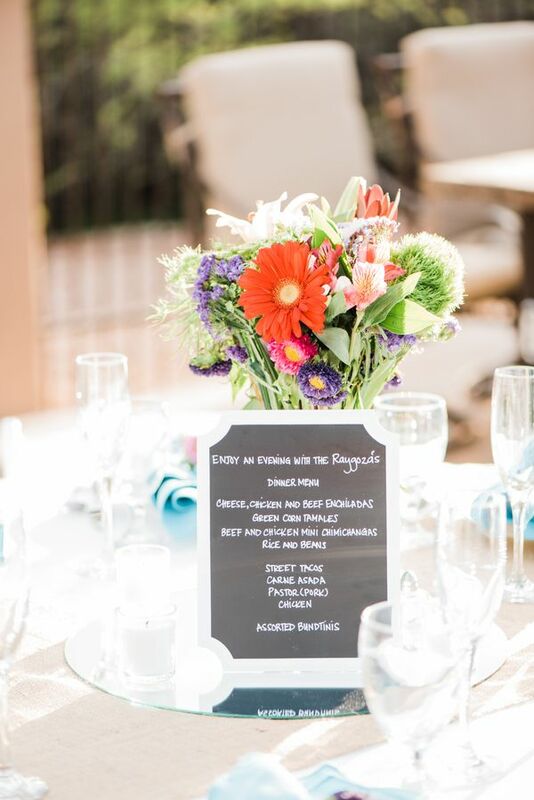 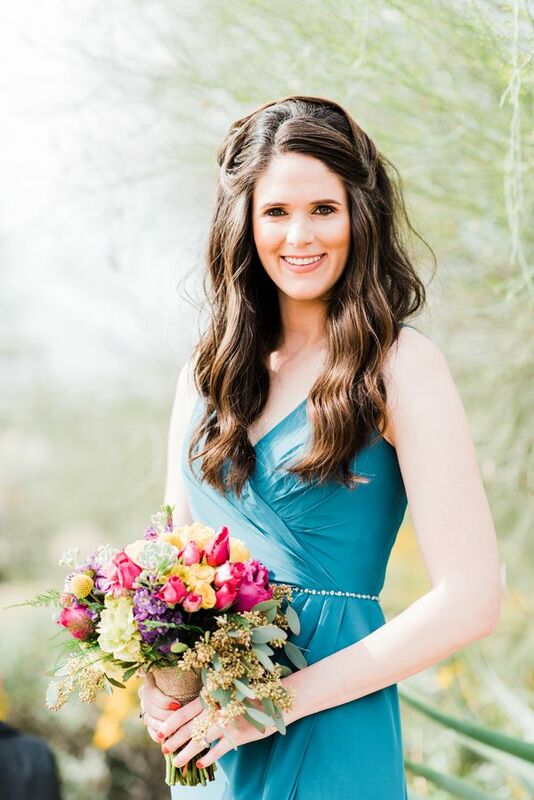 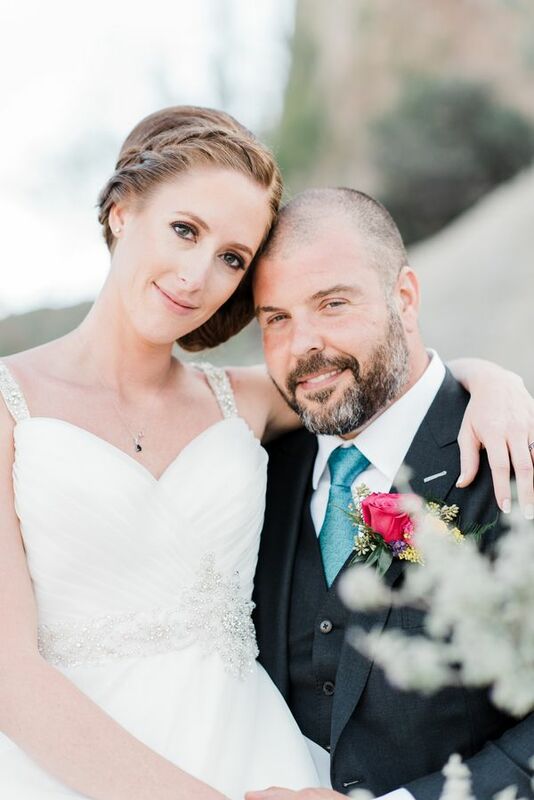 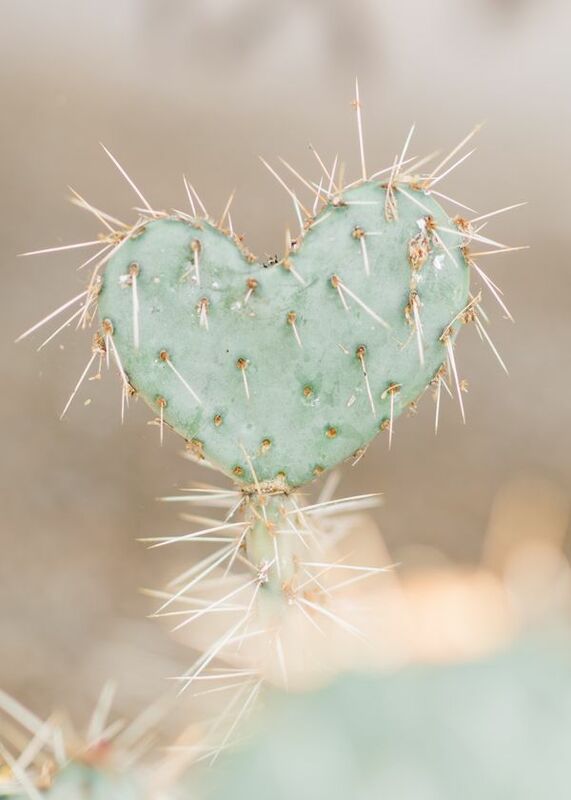 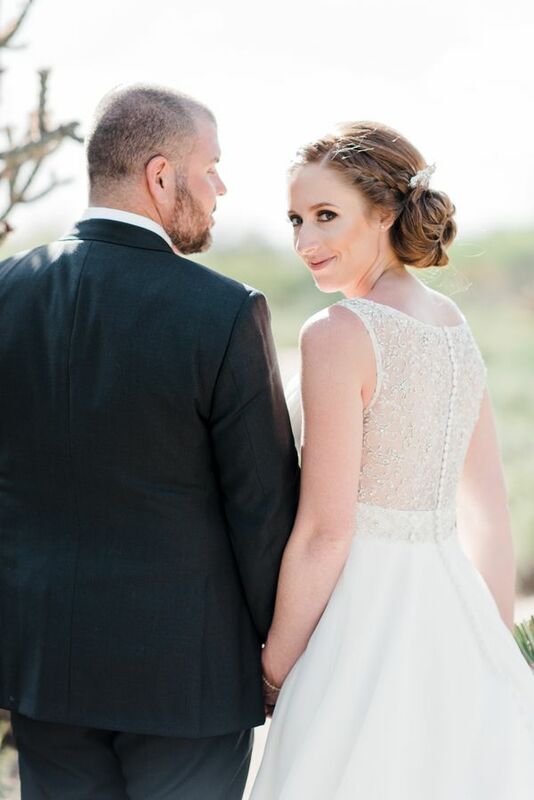 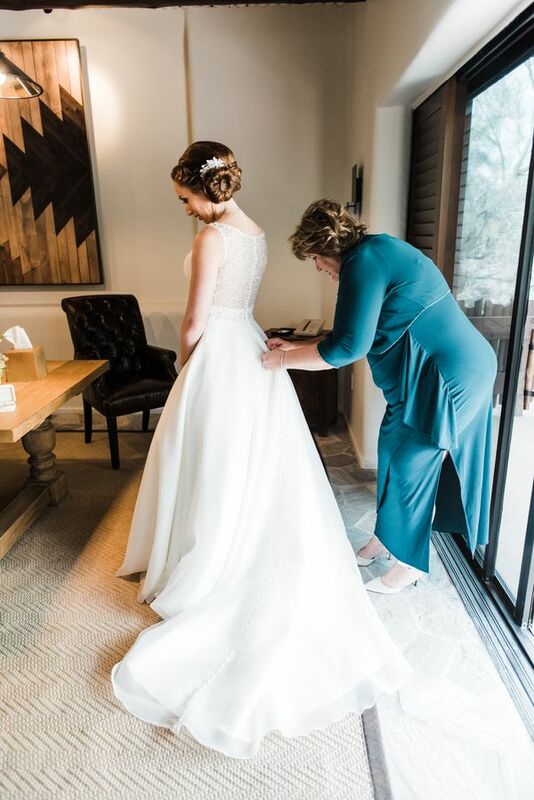 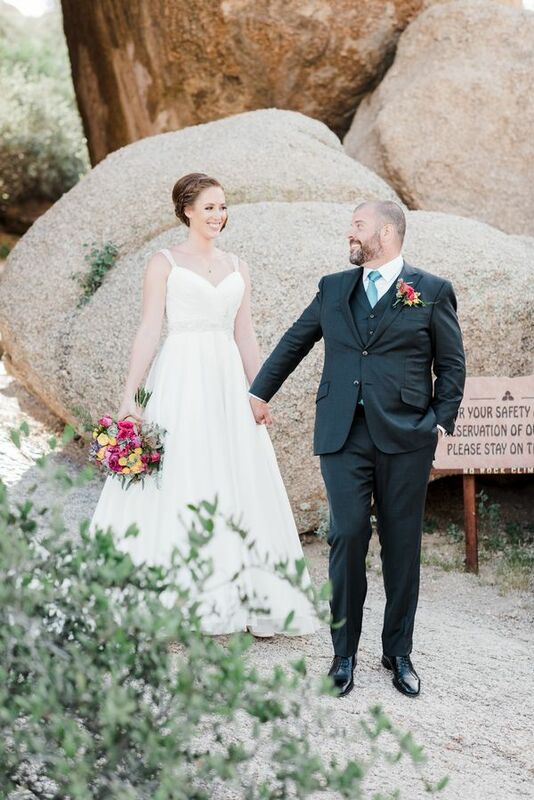 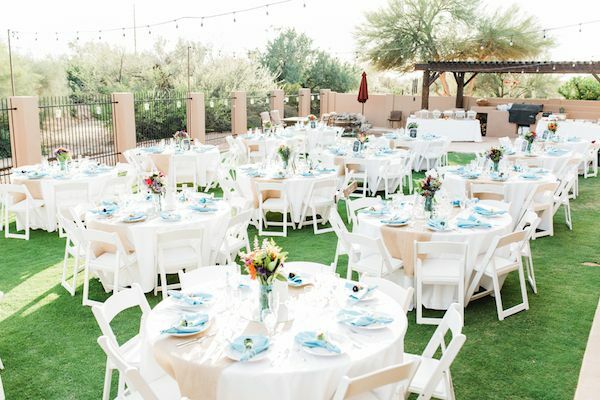 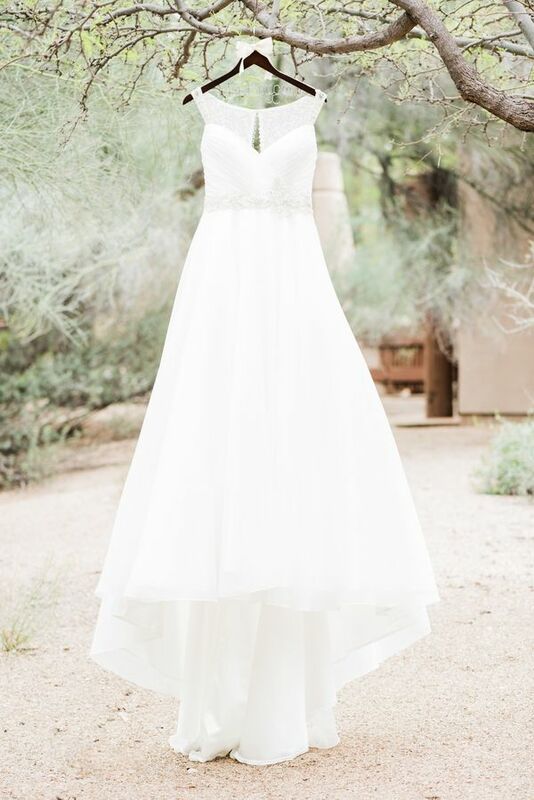 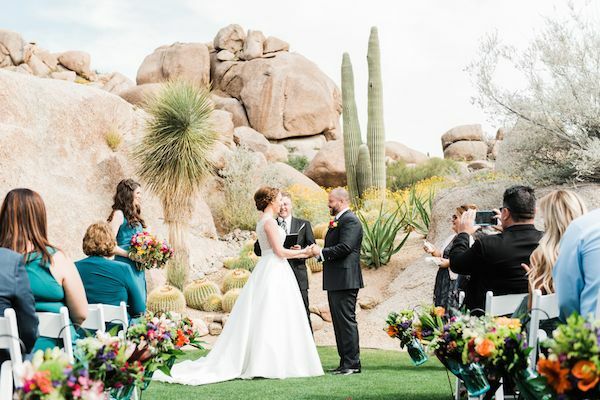 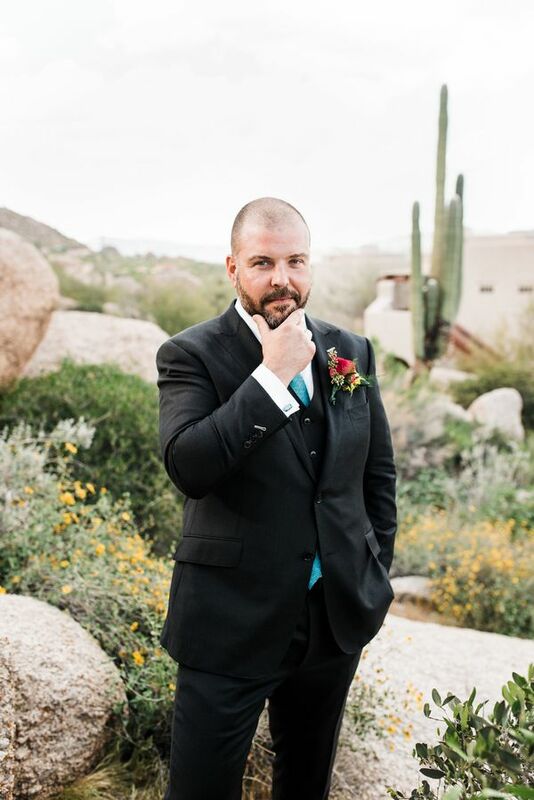 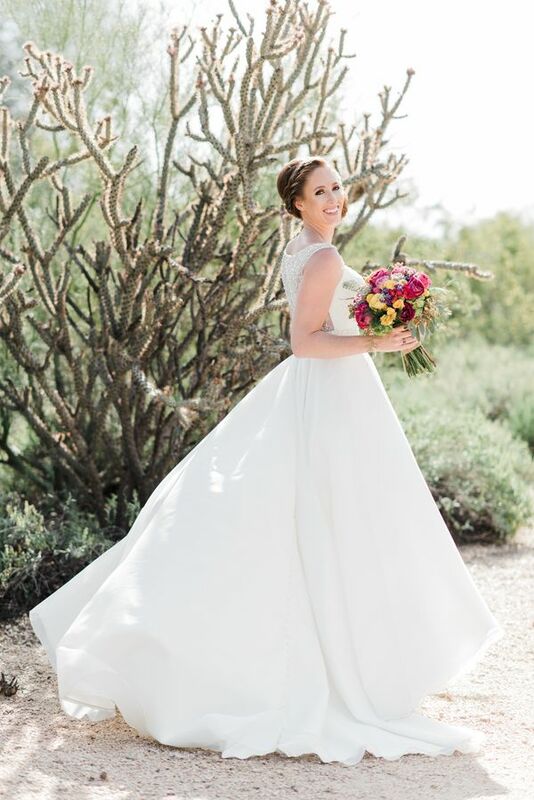 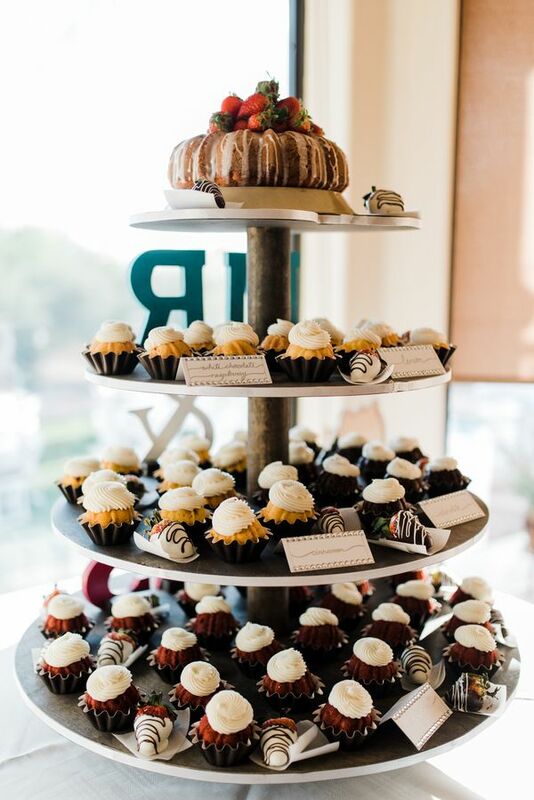 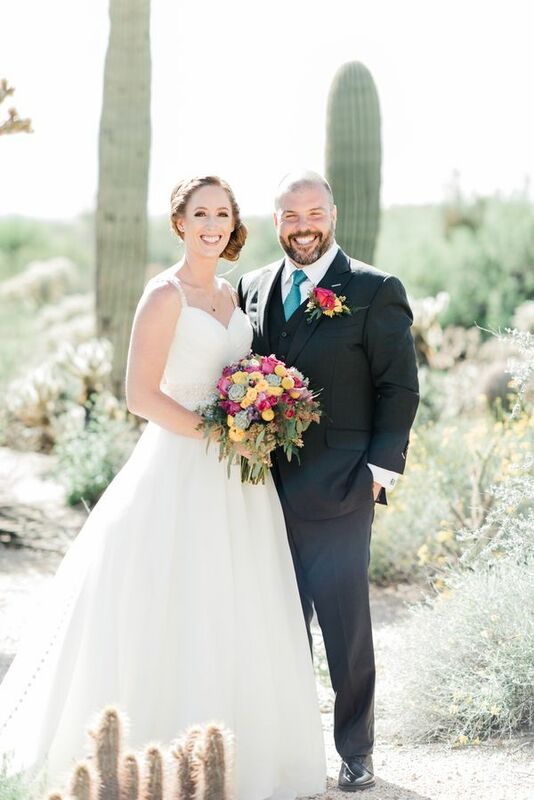 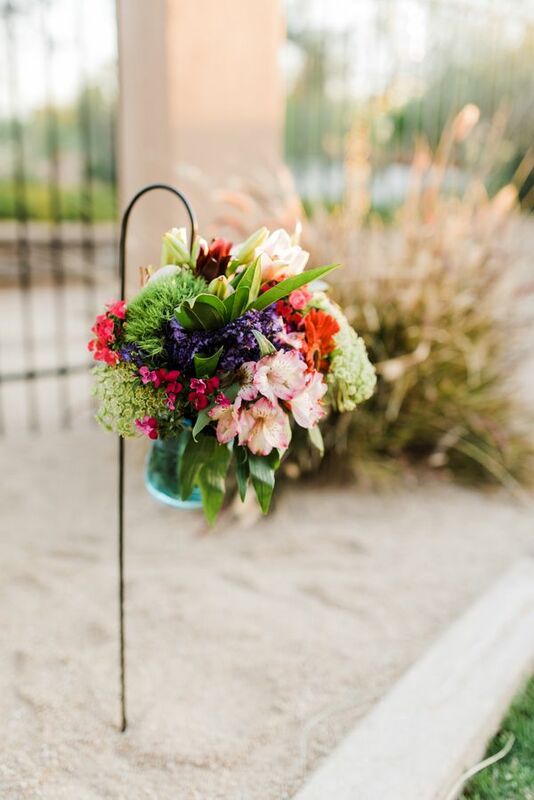 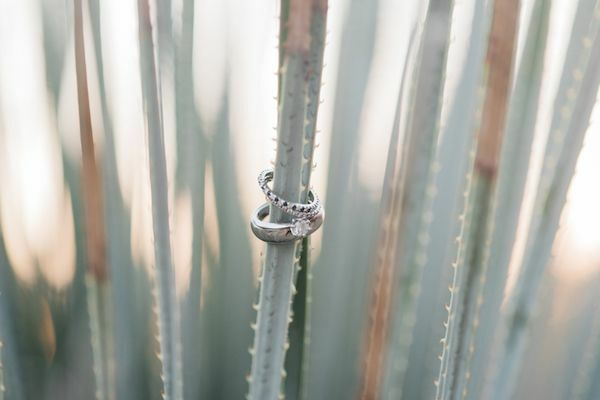 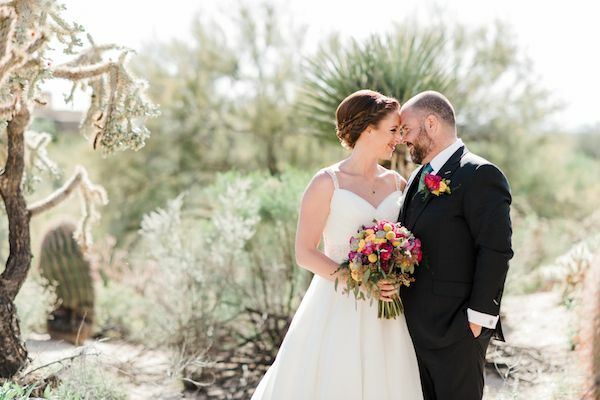 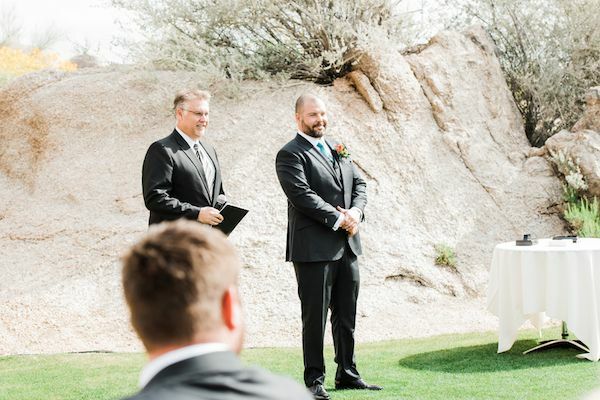 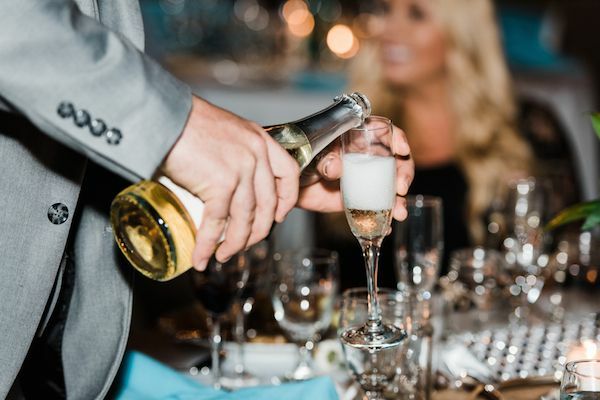 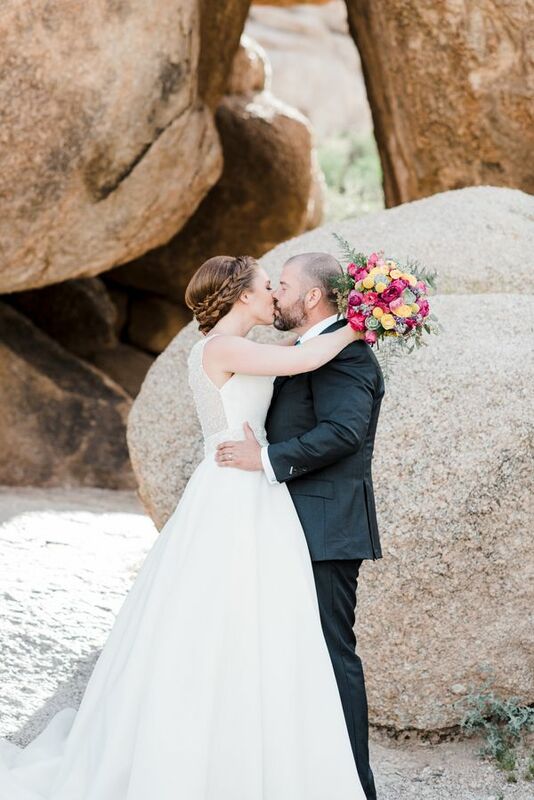 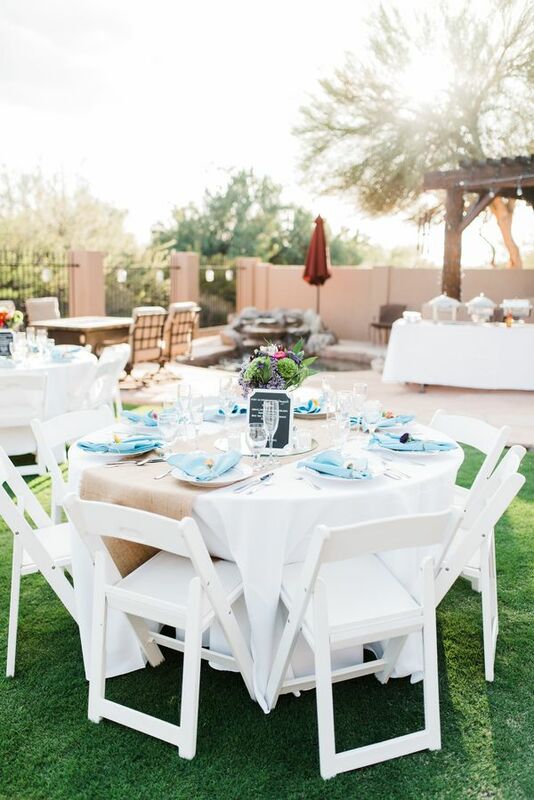 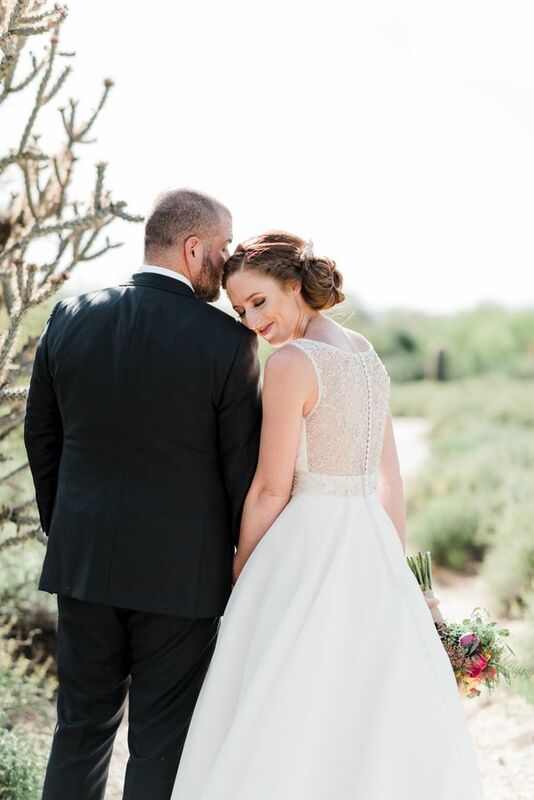 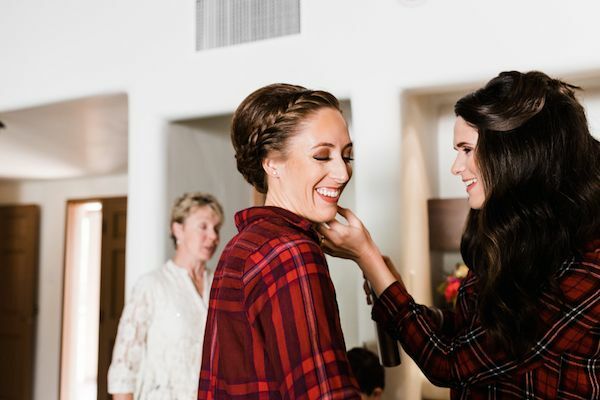 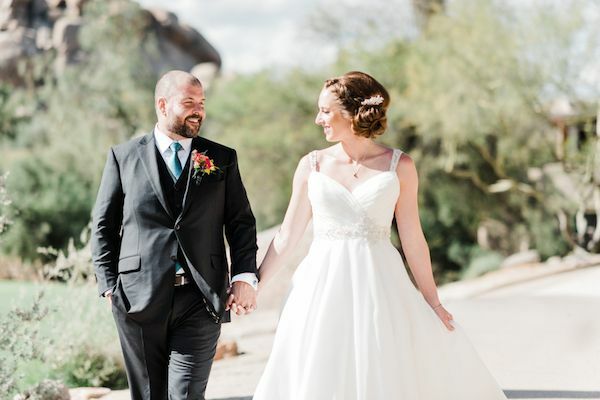 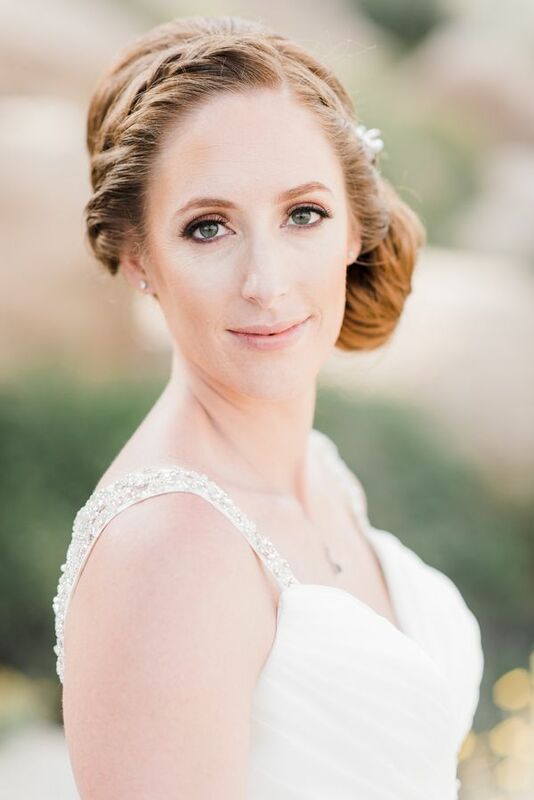 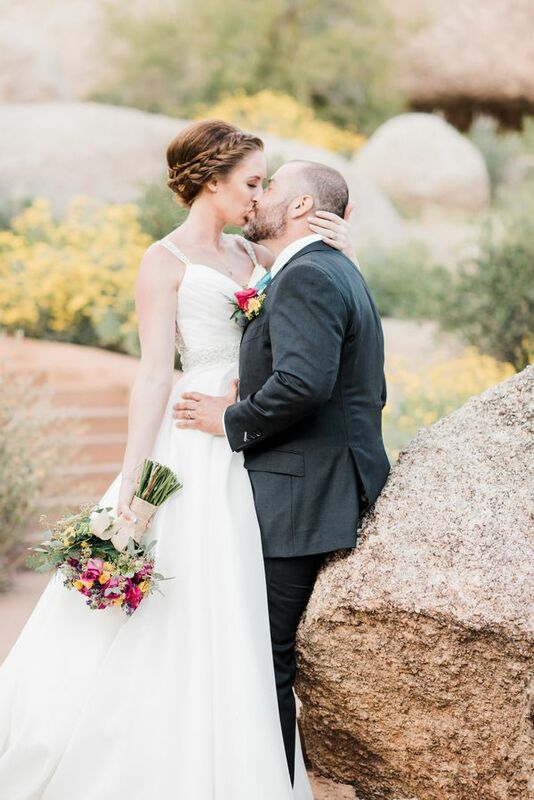 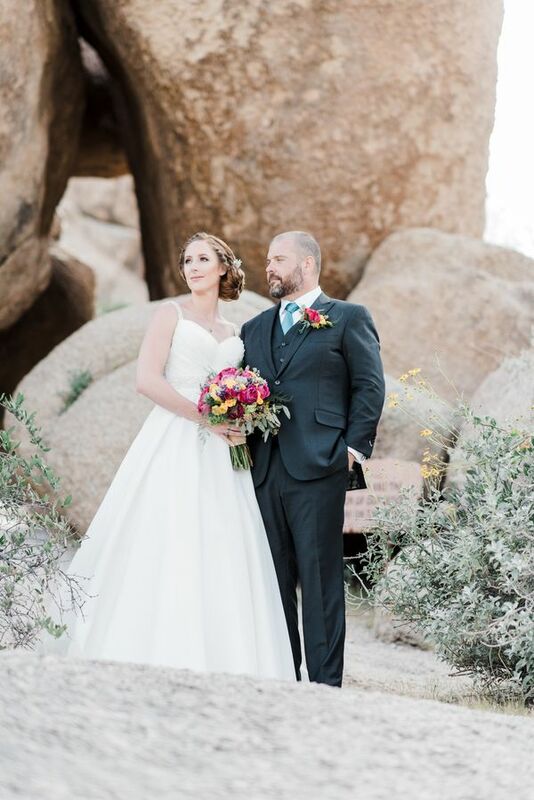 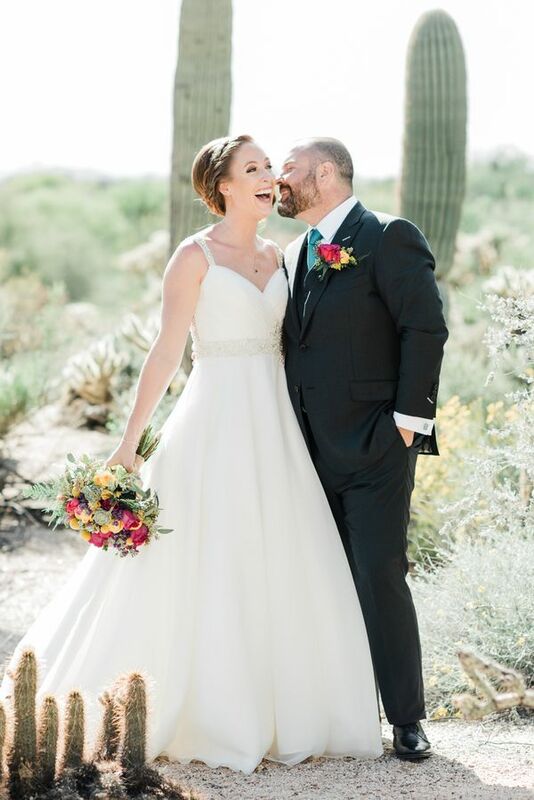 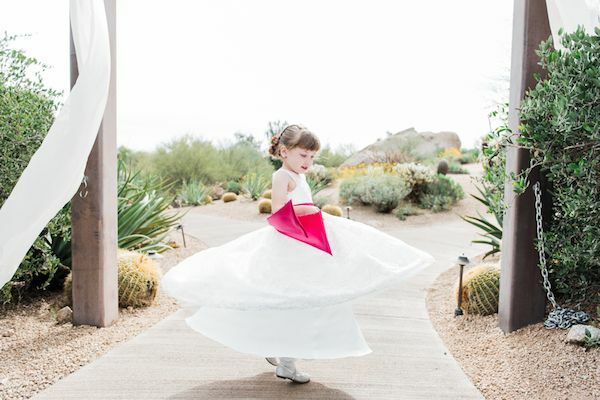 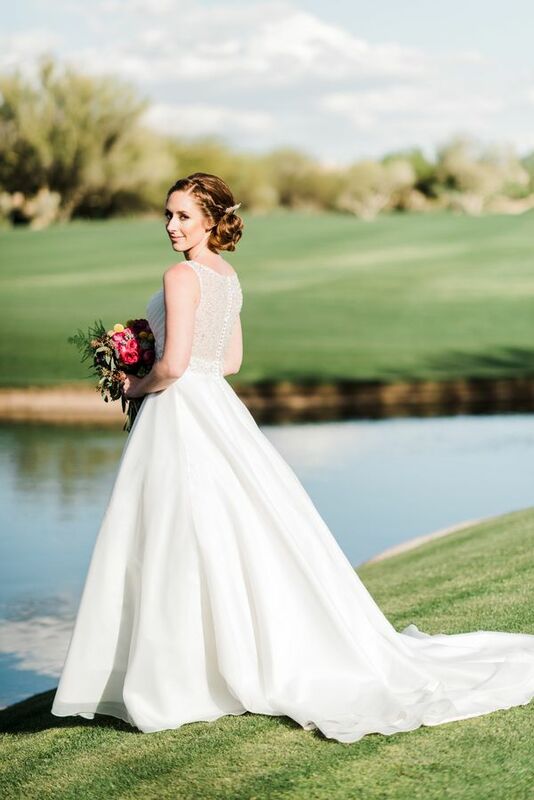 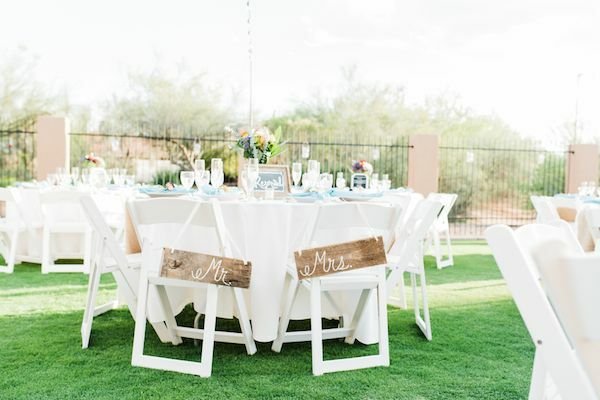 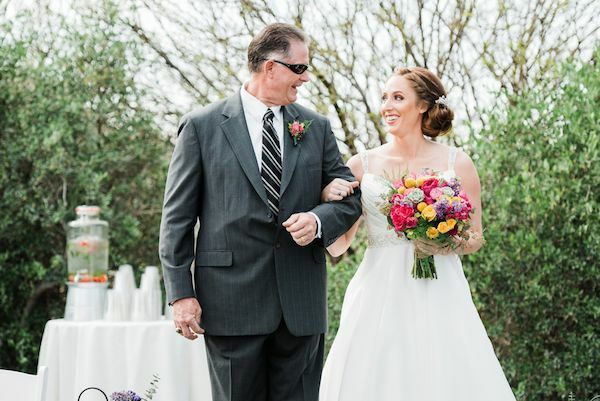 Ashley and Ryan Raygoza, a sweet couple from Southern California, were married at the beautiful Boulders Resort located in Scottsdale, Arizona — in an elegant wedding full of heartfelt moments and gorgeous details! 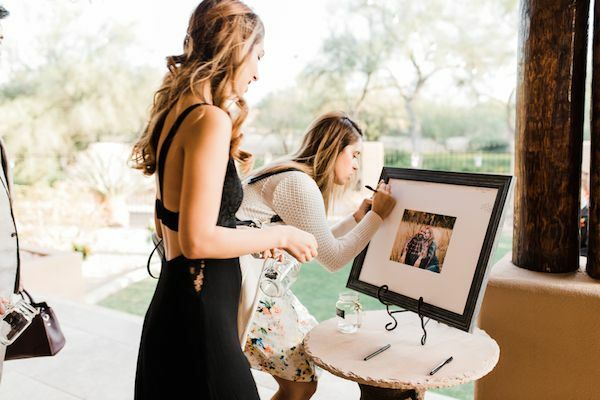 Silvana Braggio Photography shares some insight into their day, "The loving pair knew immediately that they had found 'the one' when they met." 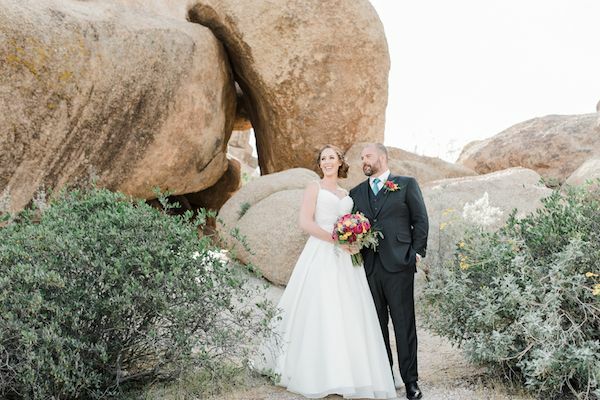 "Similarly, when we met to discuss photography for their wedding day, they booked my services without hesitation or further research (no complaints here!) 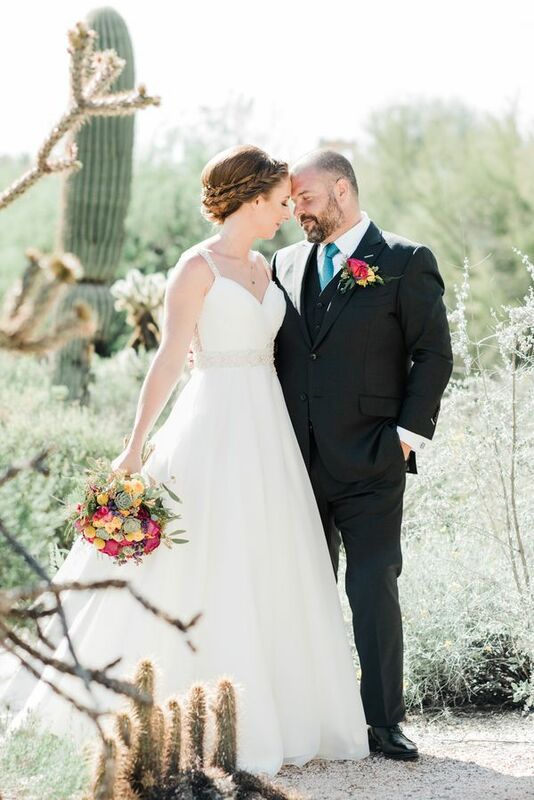 because I had the same good connection with them." 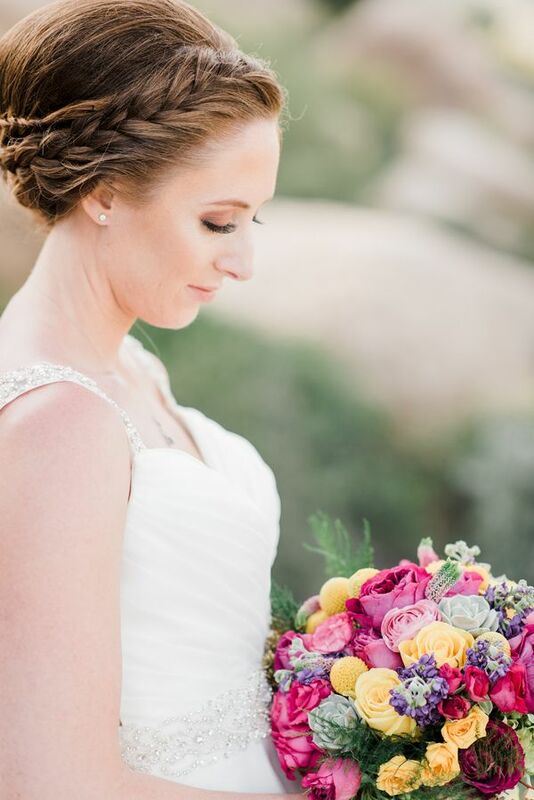 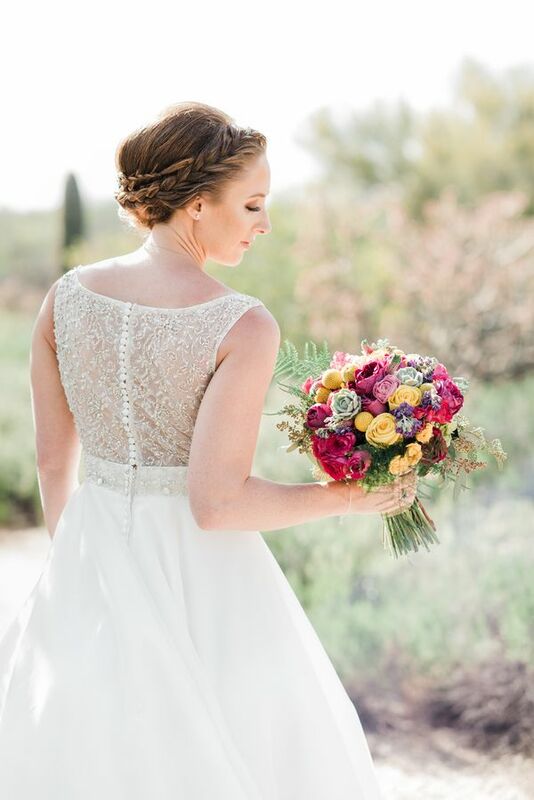 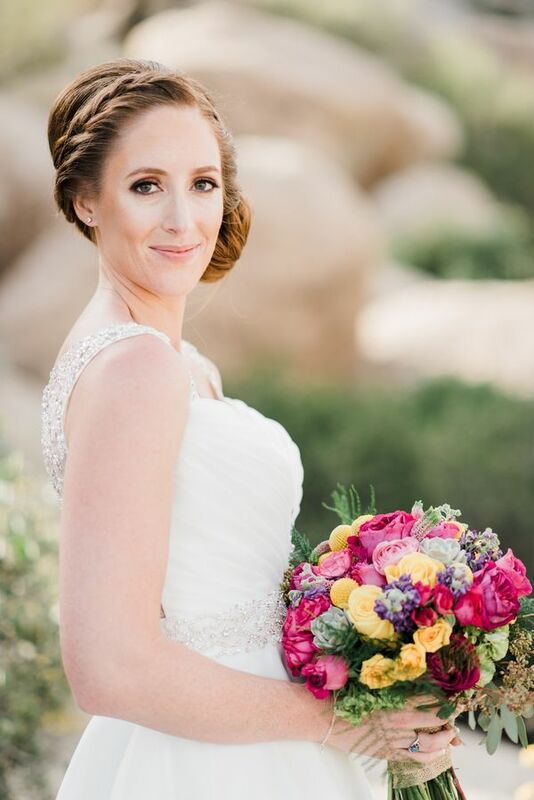 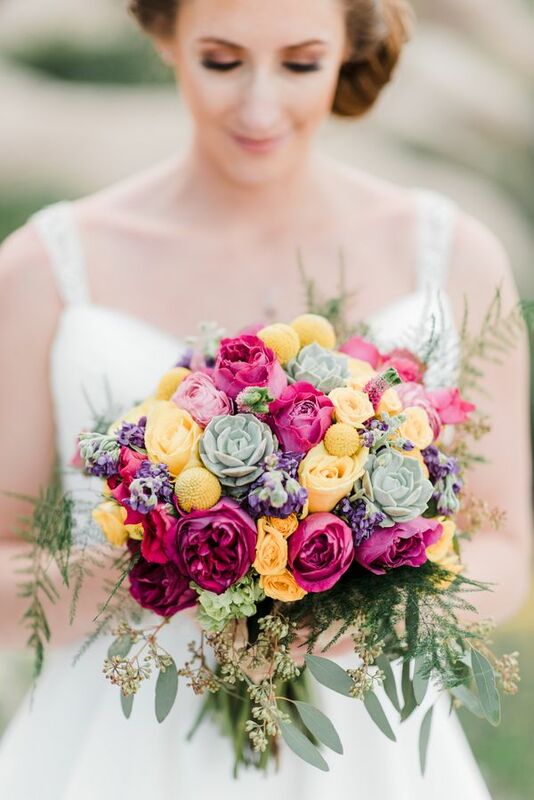 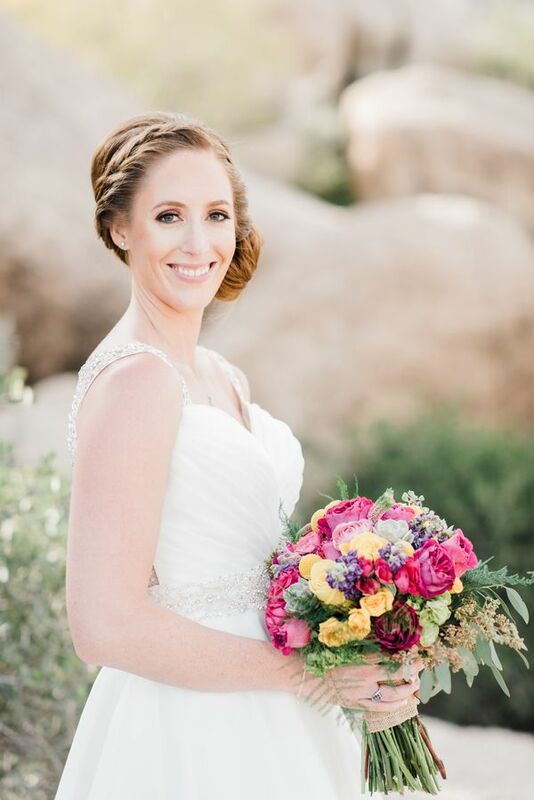 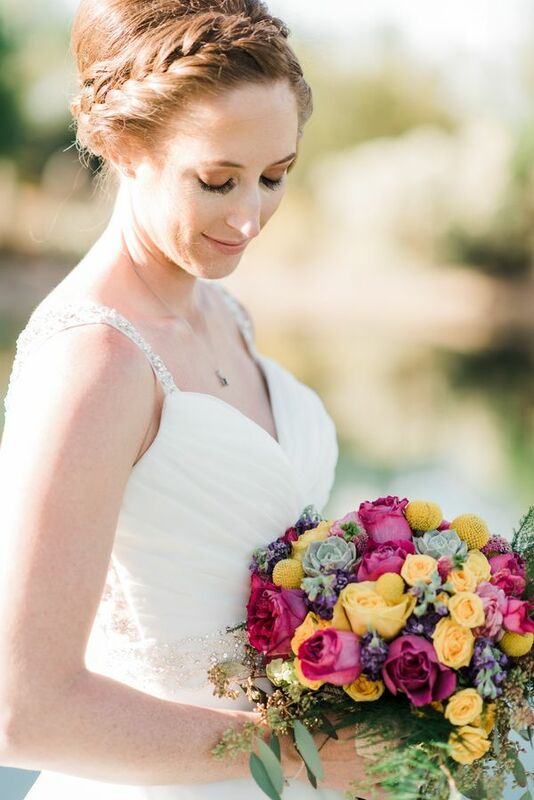 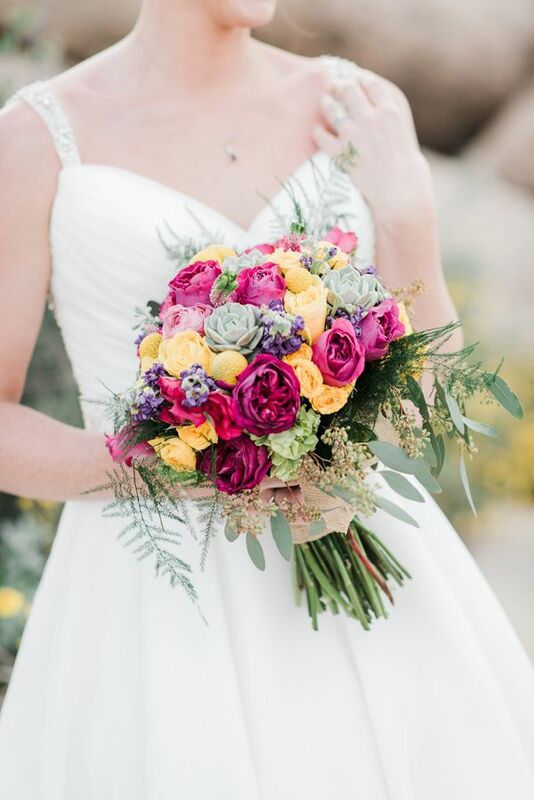 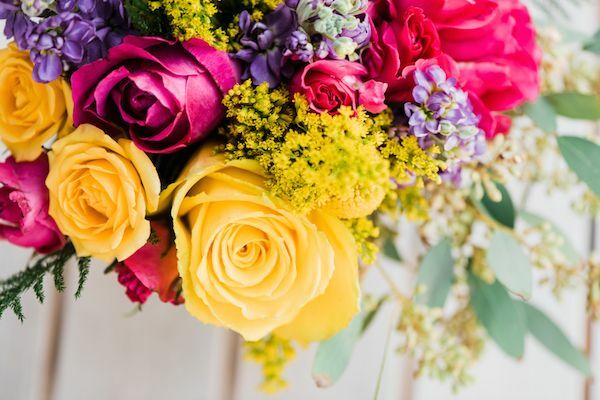 "Ashley's classic, A-line princess style ball gown gave off a soft femininity which paired immaculately with vibrant pink and yellow floral bouquets." 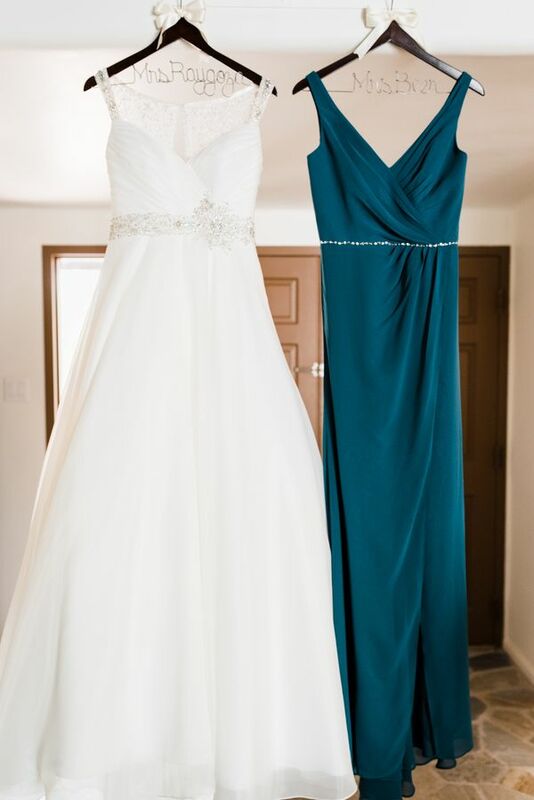 "And the bridesmaids' blue gown was rich and breezy against the mountainous rocky backdrop. 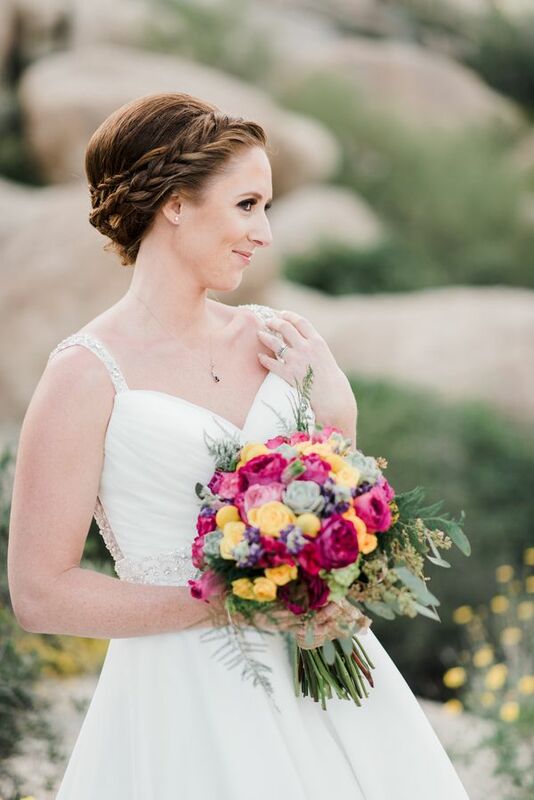 Every little detail, even down to the bride's braided bun up-do, complemented each other with ease. 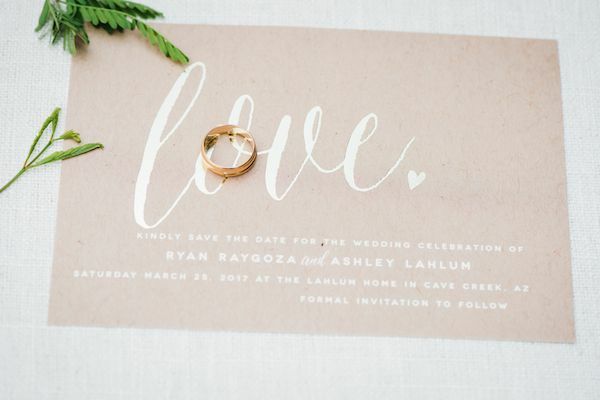 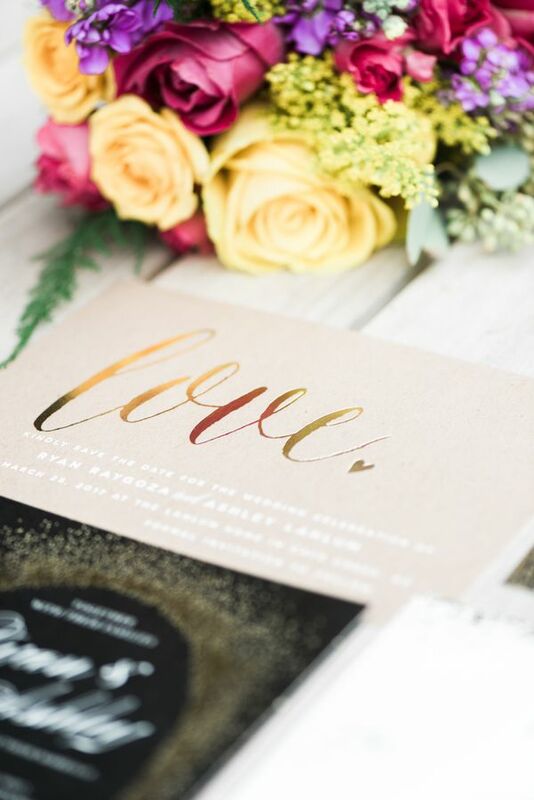 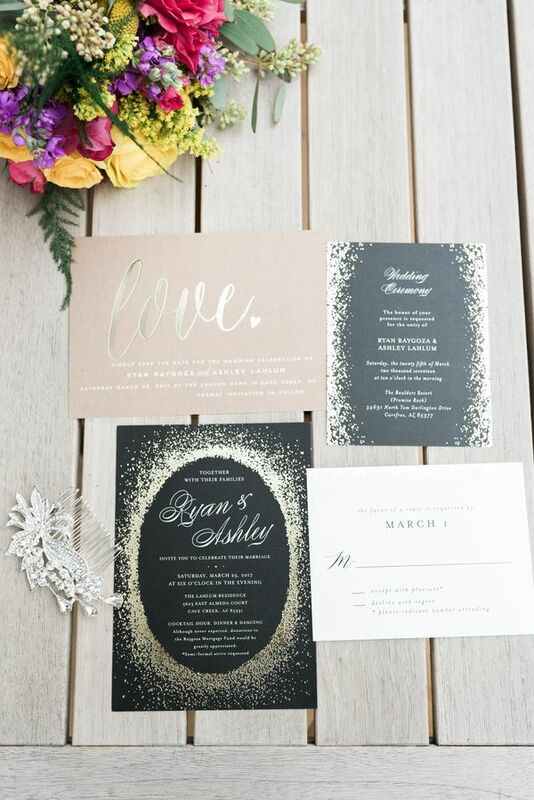 Wedding Invitations and Save the Dates from Minted, set the scene for their ultra sweet wedding day! 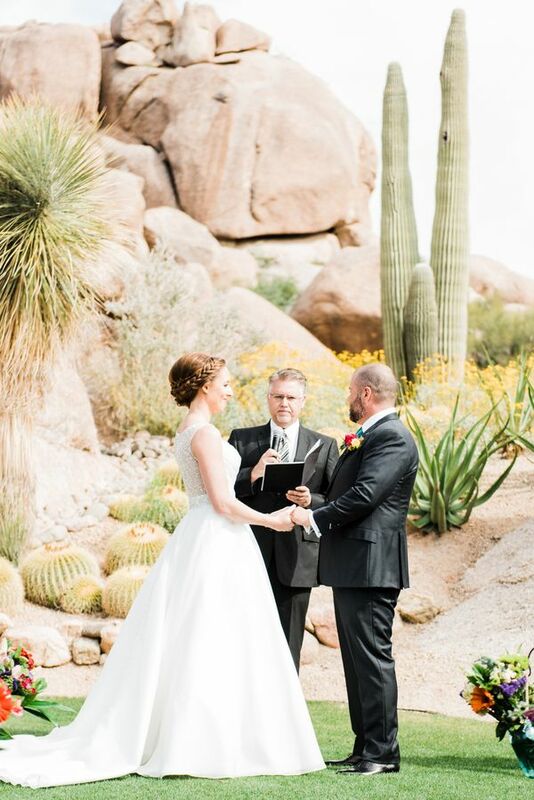 And the Arizona desert backdrop made for the loveliest Cheers, m'dears! 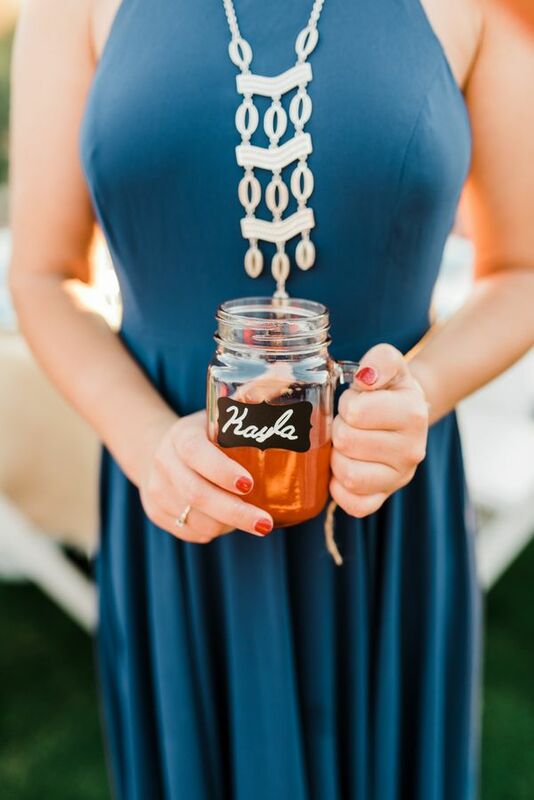 Did someone say cocktail hour? 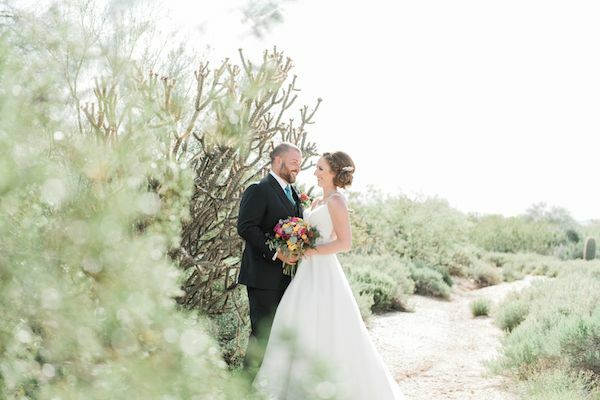 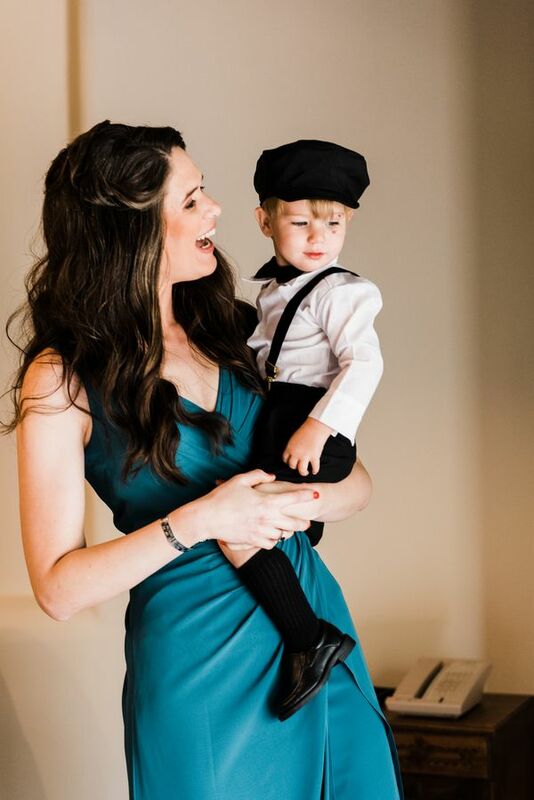 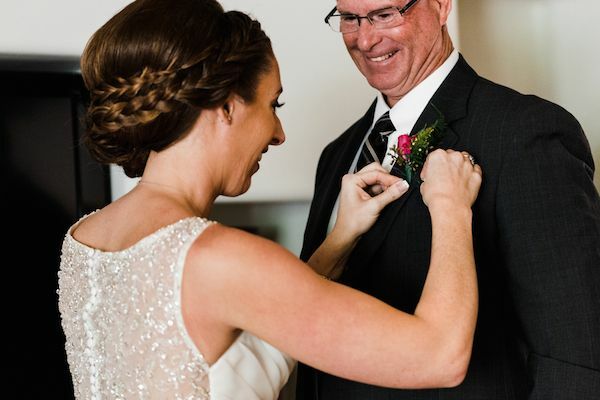 More from the photographer, "Their gorgeous wedding day ended with a backyard reception at their parents' house, where the newlyweds danced the night away under the stars." 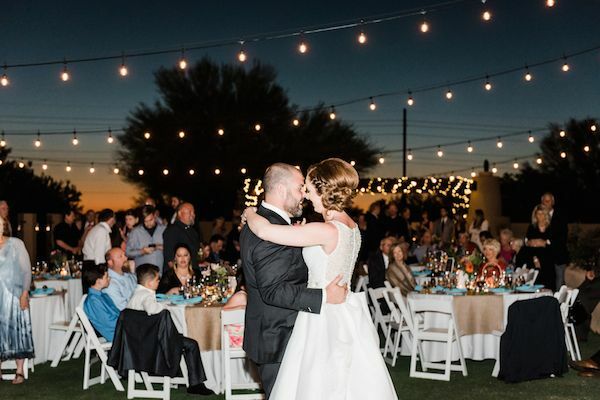 "Romantic string lights set the scene against a pastel sunset. 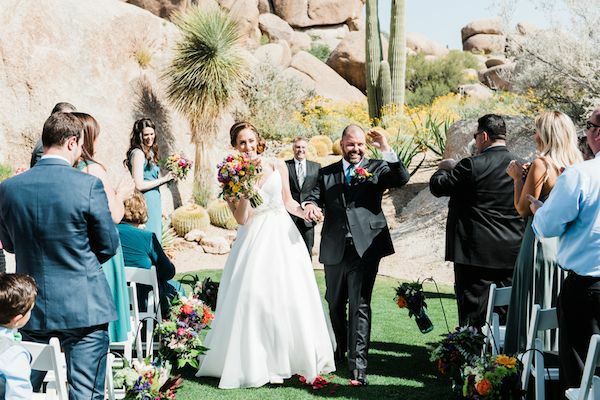 It was a day filled with love, laughter and happy tears that the couple, and all who partook in the day, will forever cherish." 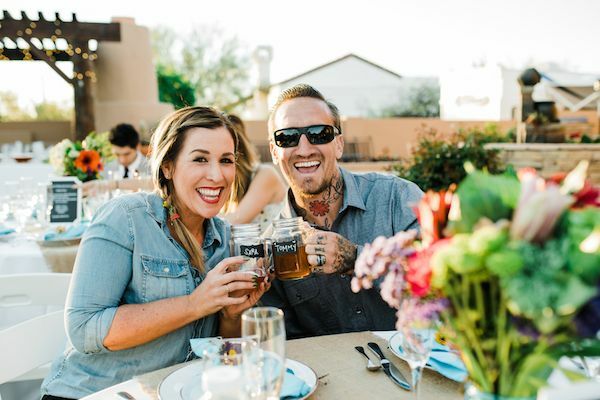 Cheers to Ashley and Ryan! 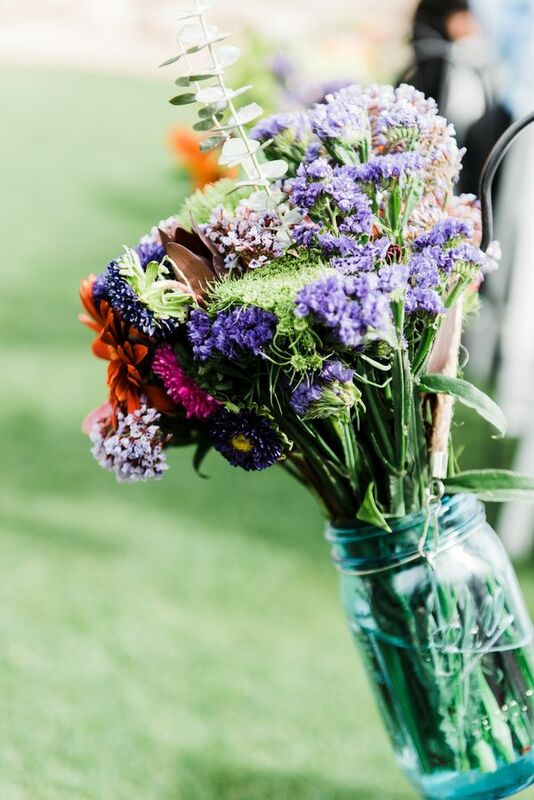 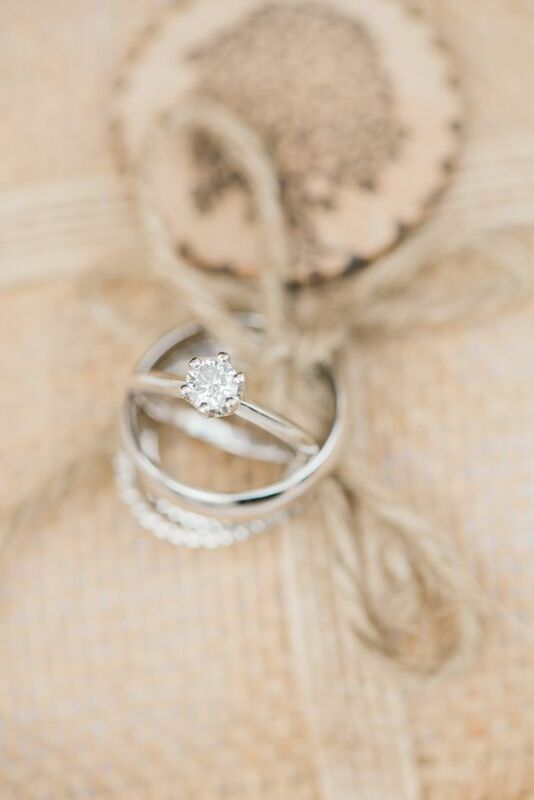 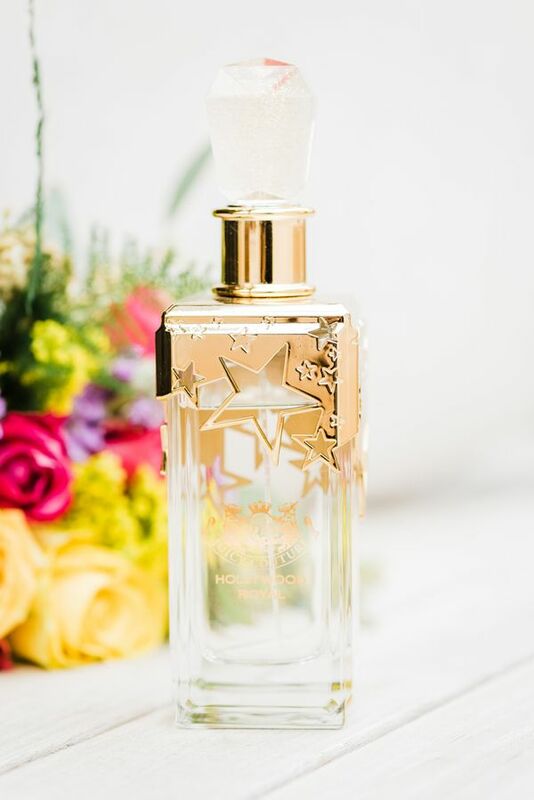 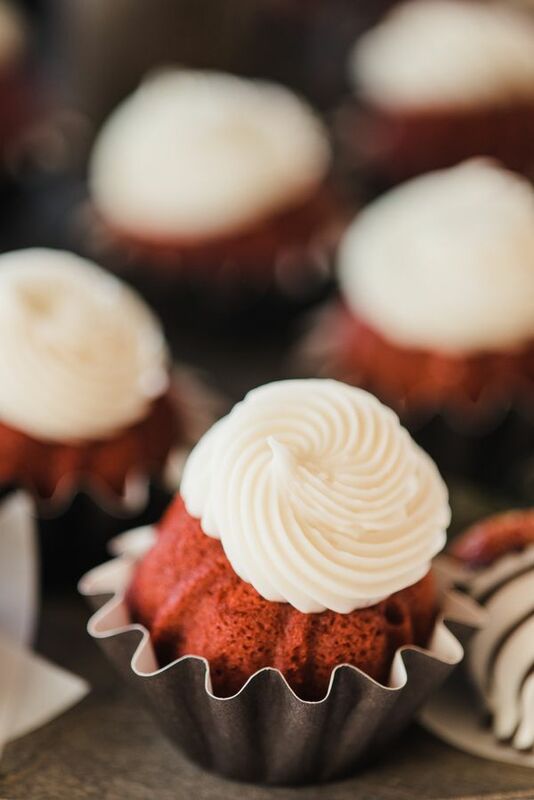 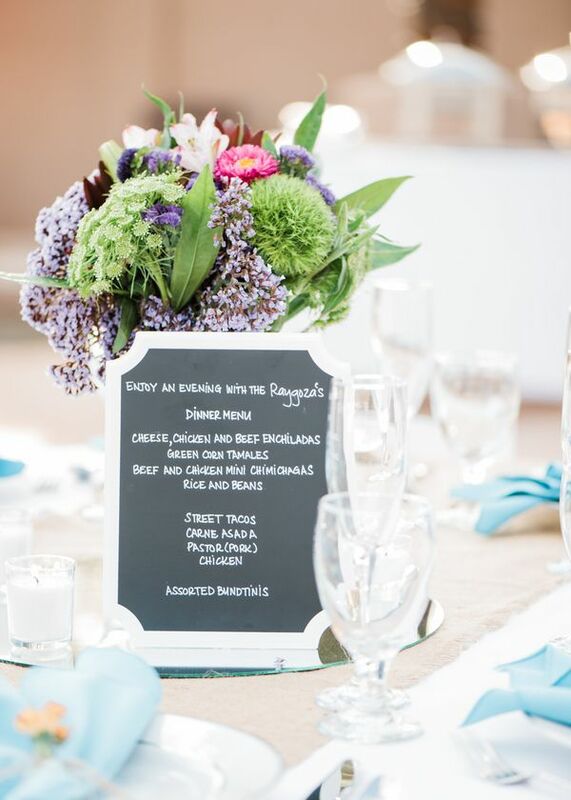 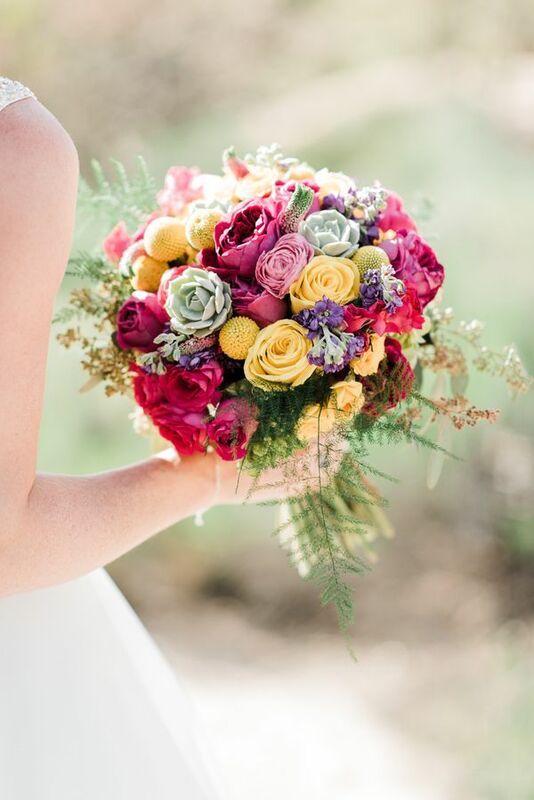 We can't wait to share the pretty over on pinterest! 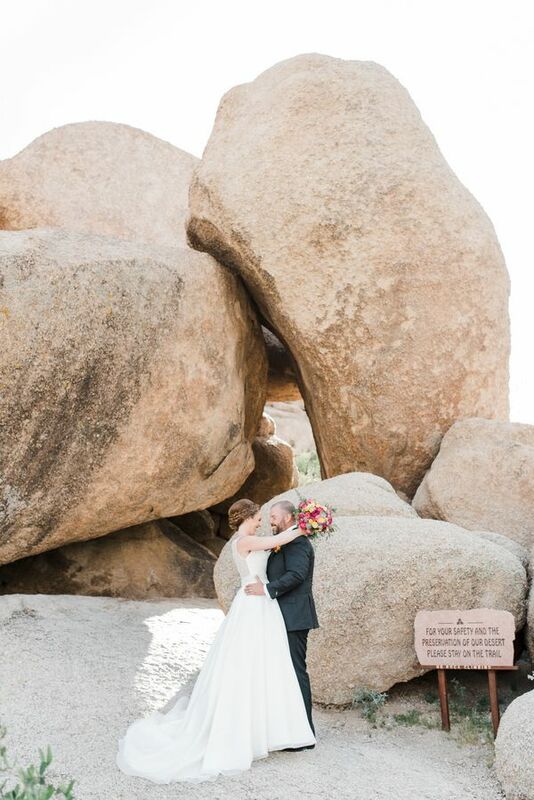 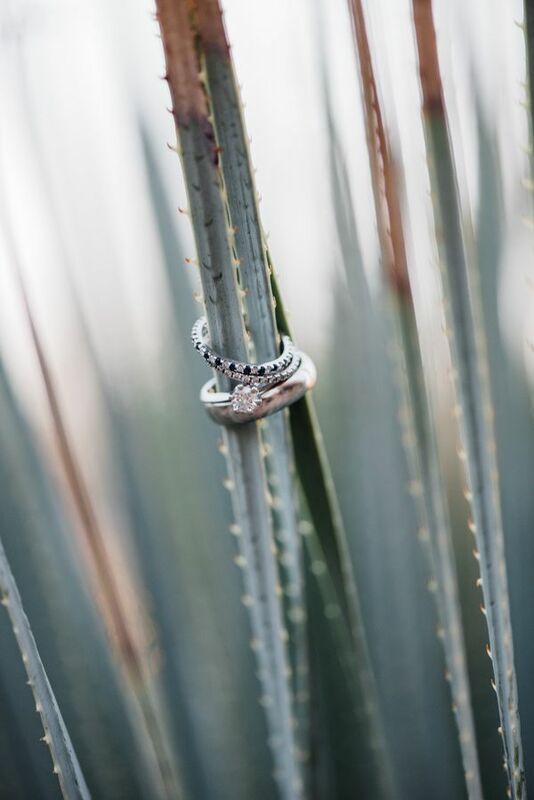 5 Comments " Ashley & Ryan's Promise Rock Wedding day "
The location for the wedding is perfect. 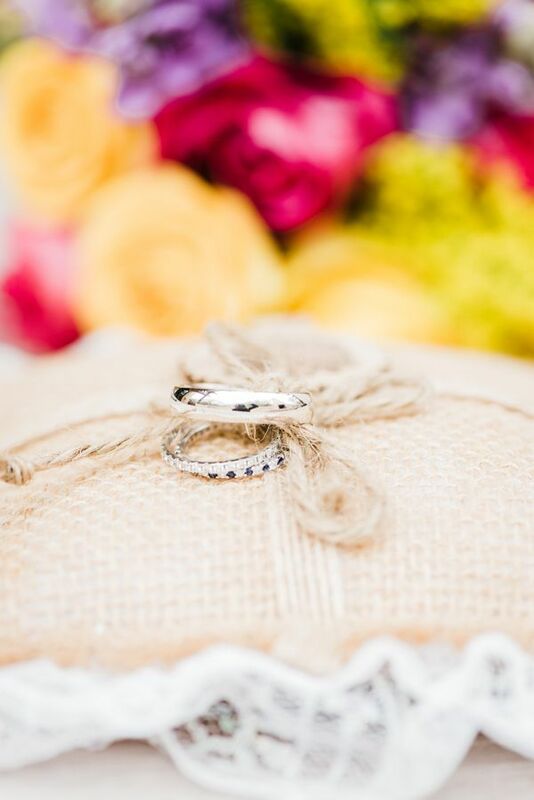 The fact that the picture are desaturated gives the wedding a rustic mood.Congratulation for the lovely couple. 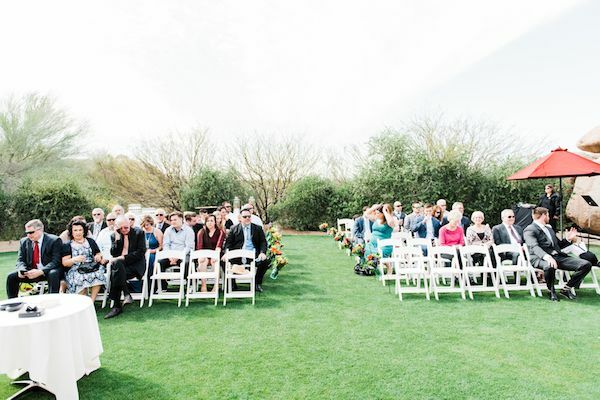 Interesting marriage function. 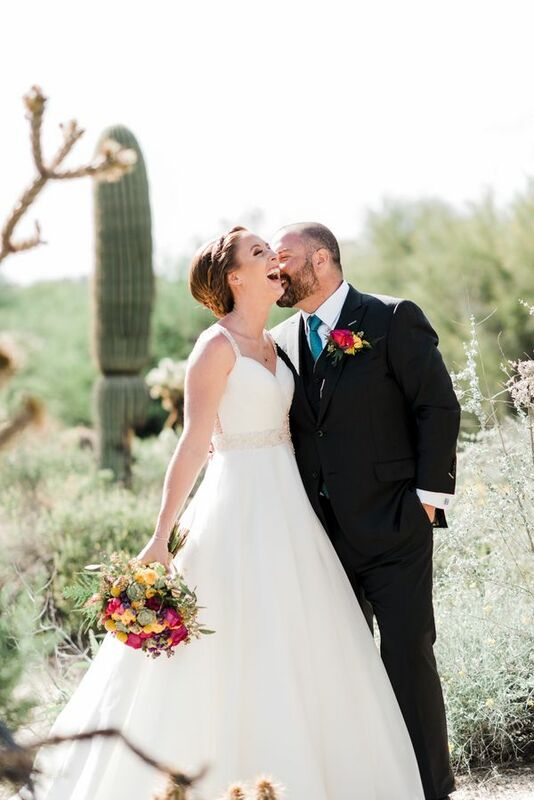 from my team of custom essay writing service, I wishing you both lifetime of everlasting love and happiness. 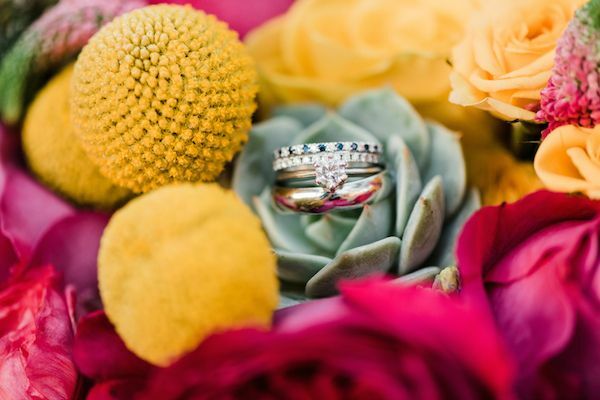 Absolutely beautiful colors - the location is simply perfect too!